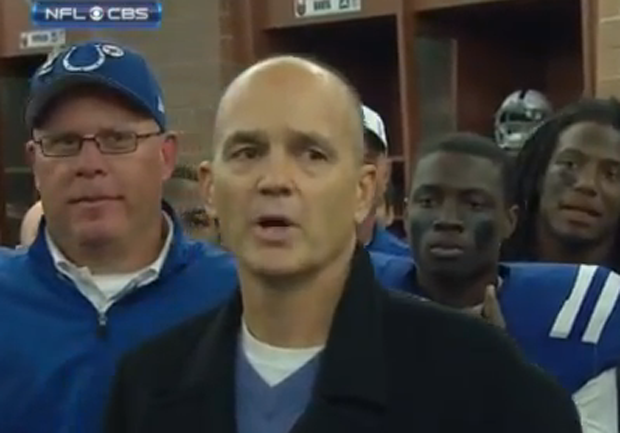 INDIANAPOLIS Colts head coach Chuck Pagano can resume coaching whenever he's ready. On Thursday, Dr. Larry Cripe, told The Associated Press that Pagano had been cleared to return and that it was up to the coach and the Colts to determine when that will happen, and how much Pagano will do. Pagano's physician is not imposing any restrictions, either. Pagano is expected to return to the team complex as early as Monday. "Medically, I see no reason he cannot come back when he's ready to try and come back," Cripe said. "Coach has done a great job with this, and I trust him." Cripe said he gave Pagano the good news the last time they met, though he declined to say when that happened. Pagano has not been on the sideline since a Sept. 23 loss to Jacksonville, Indy's only home defeat this season. Three days later, he was diagnosed with leukemia and immediately began the first of three rounds of chemotherapy. Players and most of the assistant coaches were told Oct. 1, the day the Colts returned from their bye, that Pagano was taking an indefinite leave from the team and that offensive coordinator Bruce Arians would fill in as interim coach. The team has left the light on in Pagano's office since then. On Nov. 5, Cripe said the disease was in "complete remission" and that Pagano would undergo two more rounds of chemotherapy to ensure all the cancer cells had been destroyed. Pagano is scheduled to take oral medication and be closely monitored by doctors for the next two years. Last month, dozens of players had their heads shaved to show support for their coach and Pagano addressed his players in an emotional locker room speech. During treatment, Pagano stayed in communication with players and coaches through phone calls and text messages; watched tape of practices and games; occasionally showed up at the team complex; and has spoken to the team before and after home games. All the while, doctors continuously monitored Pagano's white blood-cell count to make sure the recovery was progressing. But the Colts always pegged the Dec. 30 regular-season finale against Houston as the date they hoped to have Pagano back on the sideline  a goal that now appears likely to be met. "I love that guy and I would love to see him in person on the sideline," Cripe said when asked if he would attend the Dec. 30 game. "To me, the bottom line is that he's done what he needed to do, and he's done it with the clear goal that he wants to be coaching as soon as he can." Officially, the Colts (9-5) have not said when Pagano will return. On Wednesday, Arians told reporters the team was keeping its fingers crossed and that it would be a "great Christmas present" if Pagano returned on Christmas Eve. When asked if he was ready to coach his final game, Arians responded: "Heck, yes." Players are eager to get him back, too. "It's going to be crazy. It's going to be a great moment, just having him back on an everyday basis with the team, knowing that's what he really wants, back with us coaching and back on the sideline," safety Antoine Bethea said. "Obviously we know it's going to be emotional. It's going to be a great time." Cripe has given Pagano the same advice he does all of his patients: Don't try to do too much too fast. "Look, if you get pooped out, adjust," he said. What Pagano will find when he gets back is a vastly different team. In early October, many still considered Indy one of the league's worst teams. Now, the Colts are a confident group on the verge of clinching their first playoff berth of the past-Peyton Manning era with a win Sunday at Kansas City or a Steelers loss. The Colts are also chasing history. With a win Sunday, Arians would tie the NFL record for victories after a midseason coaching change (nine) and the Colts would become only the fourth team to go from two or fewer wins to 10 or more the following season. When Pagano was still coaching, Andrew Luck was trying to get comfortable in his new NFL surroundings, too. Now he owns the league's rookie records for most fourth-quarter comebacks (six), most victories by a No. 1 overall draft choice in the modern era (nine), and most yards passing in one game (433). He needs 26 attempts, 47 completions and 74 yards passing to break the NFL's single-season rookie records in all three categories. He still has an outside chance of catching Peyton Manning's rookie record for TD passes (28). Luck is currently 308 of 564 for 3,978 yards with 20 TDs and 18 interceptions. But it was Pagano's illness that Arians credits for making all of this possible. "They found a reason to play and when a team finds a reason to play, they'll overcome some things," Arians said. "Chuck's illness took everybody, even strangers that we would bring off the street on Wednesday and we'd play on Sunday, and they'd fight their tails off. When you have guys playing hard for 60 minutes, you're going to win some games because most teams in this league don't play hard for 60 minutes." Most expect the transition from Arians back to Pagano to go smoothly. Coaches are anticipating the day-to-day operations will essentially remain unchanged from the script Pagano followed before taking his leave. "We would always talk back and forth about what was good, what was not good and how we were going to try and defend our next opponent. So we're going to go back to that," defensive coordinator Greg Manusky said. He added: "When he comes in, we're ready to roll, same thing. It's uncharted territory I guess you would say."